This is a cross country skiers paradise! The 'German Black Forest' offers a superb 100km (63 miles) point-to-point ski journey. The complete north to south Black Forest traverse is known as the Fernskiwanderweg. This trip is designed to ski the Traverse 'highlights', but if snow conditions allow we will ski the entire route point-to-point. This famous 'Grand German Traverse' lies north of Freiburg and Basel, near the borders of France and Switzerland. The skiing, which has been a tradition here since 1890, is all on prepared tracks on classic style 'langlauf' cross country skis. Our tour traverses the diverse landscape of the Upper Black Forest staying in lovely guest houses and inns whilst enjoying German hospitality along the way. This 5-day ski journey, between the villages of Schonach im Schwarzwald in the north and Multen/Belchen in the south, climbs some 3200m (10,496ft) whilst keeping an altitude of about 1000m (3280ft) most of the way. We alternate skiing through deep valleys, forests and farming communities. This was a great holiday. The Black Forest was beautiful in the snow and the views were far reaching. Every day was fun and well organised by Julia. The accommodation was convenient, clean and quiet. There wasn't a 'best moment', it was all very good. Thank you so much for everything you did to make sure the Black Forest trip worked so well. Thanks too, as ever, for the constant support and encouragement and the great instruction. I’m really chuffed to have been able to do an actual journey on skis and to have myself progress so much in only 5 days - both technically and psychologically! We start our trip by meeting at our hotel in the village of Schonach im Schwarzwald, at 875m (2870ft), a short distance from Triberg and home to the one of world's largest cuckoo clocks! On arrival ask the hotel for your 'Guest Card' to benefit from reduced entrance fees to local sights and to use the bus and trains for free. Triberg is a charming market town and early arrivals may have time to visit the Black Forest Museum and Germany's highest waterfalls. This evening your guide will meet you at your accommodation to organise ski hire, brief you on the days ahead, and answer any questions. Your guide will choose the best area to find your ski legs today. Skiing either from Schonach itself if the tracks are prepared or a little higher at Rohrhardsberg which sits at 1152m (3778ft). The trail passes through dense forests over well kept tracks in Nordic rolling terrain, an excellent introduction to the Black Forest. We soon join the Fernskiwanderweg or 'remote ski trail' as it meets a ridge line, it then opens out to a wide meadow and the lovely old chapel at Martinskapelle. We have time to stop for refreshments at the inn and can take a short diversion to visit the spring which is one of the sources of the famous River Danube. A final short climb takes us up to Brend at 1149m (3768ft) which is known as the highest peak in the 'holiday region' of the northern Black Forest. On a clear day you can see across to Feldberg, the Swiss Alps and Vosges mountain ranges. Our hotel is in a remote location and is a beautiful place to stay in the heart of the Black Forest. We begin our ski today with either an easy section of downhill or we we may take a short transfer to the farming village of Waldau where the first Black Forest clock was made in 1664. From Waldau we ski the 'panorama' loipe out around the village picking up the Fernskiwanderweg to 'Thurner' where we meet up with a network of local trails. After a coffee stop at Thurner, whichever trail we choose we will climb up to our high point for the day at Weisstannenhöhe at 1190m (3903ft) where we can be rewarded with superb views of the Feldberg summit at 1493m (4897ft). We return to Waldua where we will spend the night. As with many Black Forest hotels tonight you will be able to relax in the sauna prior to another traditional hearty German supper. Known as the 'Pearl of the Black Forest' the lovely ski village of Hinterzarten, is just a short drive away. It sits close to the shores of Lake Titisee and Feldberg mountain. Home to the 'Schwartzwalder' Ski Museum and famous World Cup ski jumps Hinterzarten reminds us that the tradition of skiing is very important to the people of the Black Forest. 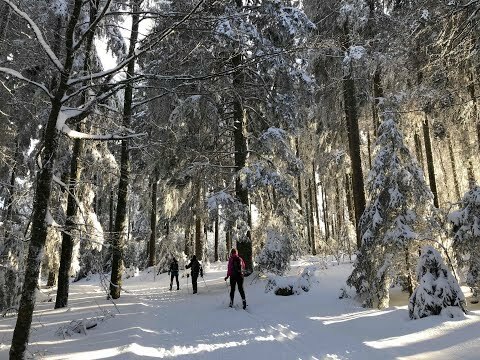 Choosing from a variety of ski trails from Hinterzarten we climb through the pine forests all at about 1200m (3936ft), passing hidden lakes, across alpine meadows all beneath the 'crown' of the Black Forest - the mountain of Feldberg. On route our trails passes a typical Black Forest inn where we can stop to refuel with strudel or the classic Schwarzwalder Kirschtorte or Black Forest gâteau before returning to Hinterzarten for our overnight. Today is the biggest day in both length and height on our 'highlights' tour. Leaving Hinterzarten we rejoin the Fernskiswanderweg trail and over several kilometres gradually climb up to see todays objective - Feldberg mountain! Skiing all on good trails nowhere does the climb feel too much (trust us)! Winding our way through the forest and taking regular breaks we soon reach a short section of un-groomed trail. Here some prefer to stow their skis on their packs and hike. After about 20 minutes we are back onto the groomed 'loipe' and are now above the tree line. A final push and the cut track actually reaches Feldberg summit. At 1493m (4897ft), the highest point of the Black Forest, we are rewarded with fabulous 360 degree panoramic views. The arc of Alps in the south, the Jura and the Vosges in France in the north make a fine picnic spot. From the top a fun and gradual descent picks up a stunning section of trail offering some of the best open views of the Black Forest. We reach the Todtnauer Hütte at 1321m (4332ft) where we can stop for a celebratory hot chocolate and perhaps another strudel! Our trail continues on and mainly down through the forests to the pass of Notschrei at 1120m (3673ft). From Notcherei we will take a bus or private transfer to our overnight accommodation. We have various options today to complete our Black Forest 'Highlights' tour. A labyrinth of ski trails this side of Feldberg gives us options to ski either from Todtnauberg village or starting back on the Fernskiwanderweg trail at Notcherei. Either way we have the option to ski to Wiedener Eck at 1034m (3391ft) for views out to the final main mountain range of the southern Black Forest, Belchen. A short climb takes us onto Hohtannhutte, another popular ski destination, before reaching the small ski resort of Multen/Belchen where we finish our journey. To make transfers simpler for the following day we spend the night at Schönau im Schwarzwald, a short bus ride away, where we end with a final celebratory meal together. Today is departure day and the trip finishes after breakfast. With your tourist card, trains and buses leaving the area will be free to airports and main railway stations. We meet at our hotel in Schonach im Schwarzwald, in the Black Forest. Our hotel is located on the main street of the village, and has easy access to the local shops. The hotel is very welcoming, and has a small swimming pool and sauna. All room are en suite with private facilities. The hotel is directly opposite the local supermarket so if you arrive early you might want to stock up on snacks for the week ahead. This mountain guest-house is one of our favourites. It sits on the middle of the woods, but on a small high spot which means that it has glorious views over the Black Forest. The rooms are cosy with en suite facilities, and the restaurant serves up great food with a local flavour. Our hosts Antonia and Frank do whatever they can to make our stay very pleasant. This hotel is very characterful and is in traditional Black Forest style with lots of wood, and murals around the windows. It is the oldest Black Forest Inn in the area, and they are proud of their 500 year long tradition of service. All the rooms have en suite facilities. The kitchen prides itself in the use of only the freshest local ingredients. The rooms, while modern, are in keeping with the rustic theme of the hotel. You will definitely feel you have visited a true Black Forest Inn. We can usually ski to and from the door which is an added bonus! Hinterzarten is a bustling town and our hotel is located just at the end of the ski tracks! The hotel has been in the Keilbach family for several generations and Thomas the present owner is very welcoming. The bedrooms are cosy with en suite facilities. There is a spa area with sauna for relaxing. Dinner is eaten in town when we usually visit the very characterful restaurant of the imposing Hotel Schwarzwaldhof. The Hotel Sonnenhang is perched on a hillside and lies just below the forest line. The rooms are very comfortable with en suite facilities, and there is a sauna available for guests. Dinner is very much local produce and typically of the Black Forest area . The Vier Loewen is located on the main pedestrianised area of the town of Schönau im Schwarzwald and is just a short distance from all facilities. The hotel has a lovely spa area with swimming pool and it a great place to spend the last night. All rooms are en suite, and generally spacious. Dinner is eaten at our hotel. Beware of confusing the two towns for your arrival and departure points. We begin in Schonach im Schwarzwald but we end in the town of Schönau im Schwarzwald! They are not the same place. The Black Forest, in Germany is easily reached from other European and worldwide destinations by road, rail, coach or plane. The closest airports are Stuttgart, in Germany, Strasbourg, in France, or Zurich and Basel/Bale, in Switzerland. If arriving at one of the Swiss airports the trains are the most convenient form of travel taking approximately 2h30 to reach Triberg which is 3km (1.8 miles) from our accommodation at Schonach im Schwarzwald. Your visitors 'Guest Card' will give you reductions on many attractions (museums, cable cars, swimming pools etc) and free bus and train travel during your stay and return journey back to the airport (NB: this is not valid until you arrive at your hotel so will not include your travel to your first hotel). Train connections can be sourced at SBB for Swiss connections and Deutsche Bahn for German connections. Please note that timetables and tickets are normally only available 3 months in advance. Searches should be made using: Basel Euro Airport or Stuttgart Flughaven/Messe (which is on the S bahn) to: 'Triberg'. At the end of the trip you will be departing from Schönau im Schwarzwald first by the free local bus from the stop 'Sparkasse Schönau im Schwarzwald' and on to Zell where you connect to the train for Basel. If you have left a car at the start of our trip or wish to begin your return from our start point then it is possible to arrange a taxi from Schönau im Schwarzwald to Schonach im Schwarzwald/Triberg for approximately 150 Euros taking 1-4 people. Beware of the fact the two towns have very similar names! We run our Black Forest traverse at a time of year when the snow is most reliable and the tracks are well maintained. Please note that this trip is designed to ski the highlights of the route allowing you the chance to explore the area and enjoy the best of the skiing. However, if the snow conditions are such that we can ski the Traverse of the Black Forest in its entirety then that will be our aim for the week. In other words we will ensure you have a great ski trip making the best of what is available. In winter 2018 we skied the entire Traverse only removing skis for 3 metres (9ft) due to rocks on the trail! A truly fabulous journey through the Black Forest. All equipment and ski hire must be arranged in advance, as it will be necessary to pre-order correct sizes. Please make note of your equipment hire on our Booking Form. We will need to know your height, weight, normal shoe size (you must give us your everyday shoe size and not your personal adjustment for wearing boots) and the measurement of your height up to your armpits for ski pole hire. Cross country skiing equipment, which includes fishscale classic skis (not skates or waxables), Salomon boots or similar, bindings and poles, can be hired at the start of the traverse in Schonach though we prefer to hire skis in Hinterzarten as they are better quality. For this reason it is vitally important that you provide us with the correct sizes, especially for your boots as there will be no opportunity to change them until we reach Hinterzarten at the end of the third day of skiing. If hiring in Schonach the guide will accompany you to the hire shop to help with equipment selection, if we hire in Hinterzarten the guide will have collected your equipment and it will be waiting at your hotel when you arrive in Schonach. At the end of your trip your guide will collect any hire equipment and organise its return. The total ski hire for the week is approximately 135 Euros per person, this includes the cost of returning the equipment to the hire shop at the end of the trip. We ask that you make your payment for the ski hire direct to the guide in cash Euros. When booking a holiday as a solo traveller a twin bedded room comprising of two single beds, is booked as standard. This will be with someone of the same gender unless you request to pay extra for your own room. Single rooms are often limited in supply so if you would like to pay a supplement for a single room we urge you to get in touch as soon as possible. This trip has a single supplement of £285.